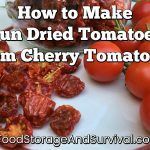 Dating your food and other rotatable preparedness supplies like batteries or cleaners, helps keep things fresh and usable in your storage. Here’s how I do it. 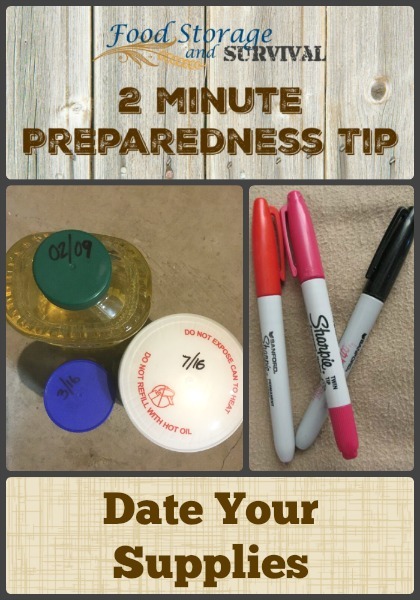 First, I use a Sharpie to mark the date or circle the expiration date on food items when I bring them home from the store so I can easily see which ones to use first in my storage room. Just keep the marker handy in your pantry or food storage room. You’ll never get stuck with super old food while you’re using fresher foods if the date you purchased them or the date they expire is clearly marked. This reduces the likelihood that your food will end up in the trash instead of being used. Circling the printed expiration date also helps you use the items before they expire. While expiration dates aren’t a magic date when your food automatically goes bad, foods will have their highest nutritional value and best flavor before the printed expiration date. Second, I use a Sharpie to mark the date I open a multiple use package. Things like a tub of shortening or a package of toilet paper or a bottle of dish soap that won’t be used all at once. By doing this, I can compare when we opened it to when we finished it and track how long it takes our family to use the whole package. Knowing that it takes us 2 months to use a large bottle of ketchup or 1 month to use a bottle of contact solution helps me calculate how many of those items we will need to have for a three month, six month, or year supply of them. You can keep track of your calculations in a spreadsheet or in a notebook. Date your supplies, and you’ll get a good idea of how much you need for your family’s emergency supply and be able to keep that supply fresh. Circling a date printed on a can would not help me at all! It takes a strong light and concentration to see and read that date. I use the Sharpie to write the date on the top and front of the can or items. Numbers at least an inch high in thick marking assures I can see the date if I am rummaging around on a shelf eye height or looking at a lower level. I can see the date on the front or top, depending where the can and I are oriented. I usually just put the year, “19”, on a can or item. Sometimes, I put the month and year, “5/19”, just depending on what I decide to do. When I dehydrate items and put them in Ball jars, I use painter tape to put the month and date on the front and top of the jar. I store beans in Ball jars, so I date them as to when I put them in the jar. I love my Sharpie marker. I need life to be easy on the reading front! I do mark packages in order to see how long it takes me to use a product. I like to know how long a tube of toothpaste lasts! Haven’t gotten to the spread sheet and probably won’t! But, I should. I wish I had been doing this from the beginning. I always mark everything these days but I didn’t when I firstborn started prepping. Definitely a good tip for beginners.